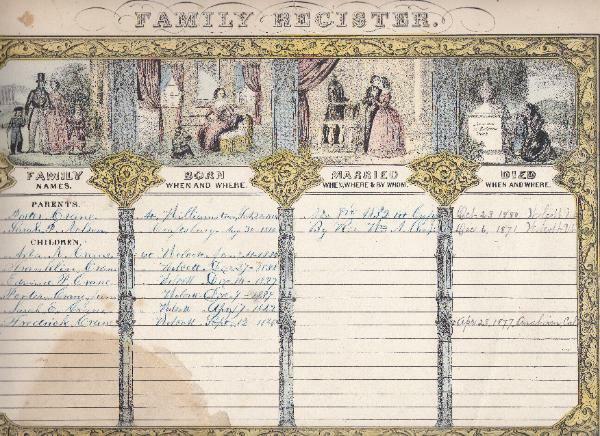 Family Register, published by James Baillie, New York City, 1846. The Family Register of Porter Crane and his wife Sarah P. Nelson. Sarah P. Nelson [born] Craftsbury Aug 30 - 1810 [died] Dec 6 1871 Wolcott Vt.
Abram N Crane [born] at Wolcott Jany 11 = 1834. Franklin Crane [born] Wolcott Dec. 27 = 1835. Edward P. Crane [born] Wolcott Dec 14 = 1837. Porter Crane Junr [born] Wolcott Dec 9 = 1839. Sarah E. Crane [born] Wolcott April 17 = 1842. Fredrick Crane [born] Wolcott Sept 12 = 1846 [died] Apr. 28, 1877 Anaheim, Cal.